OK, that's an utter, bald-faced lie. But after weeks of holiday indulgence, it's a bit of a relief to ease up on the booze-heavy eggnog and nightly post-dinner Scotches. So we'll be sticking to low-proof drinks, which are still interesting enough to satisfy that cocktail itch but virtuous enough to pair well with your all-wheat berry diet or whatever other horrid eating regimen everyone is putting themselves through. At least until resolution season is over—which, realistically, is about Jan. 10, right? There are any number of reasons to love Campari, but here's one for resolution season: Its bittersweet balance gives it a real complexity all in itself, no other spirits required. At 24 percent alcohol, a Campari soda is quite a bit less boozy than, say, a vodka soda—and a hell of a lot more interesting. Instructions: Add 1 1/2 ounces of Campari to a tall glass with ice. Top with 5 ounces of club soda. Garnish with an orange slice. Rye is a favorite winter spirit, but it tends to show up in robust, booze-heavy drinks—tasty, though not useful for our purposes. But it also pairs well with fresh cider when you're trying to tone things down a bit. Get a good, cloudy cider from the grocery store—the kind that actually tastes like apples. Instructions: In a tall glass with ice, combine 1 ounce of rye and 3 ounces fresh apple cider. Top with an ounce of soda. Garnish with a brandied cherry, if you're feeling fancy. 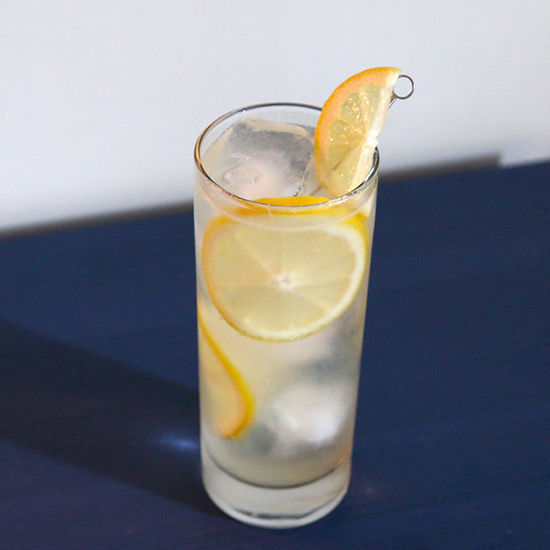 Sherry is ideal for low-proof cocktails, and fino sherry—the palest, driest kind—works particularly well in this light, lemony Collins. Half an ounce of gin adds a bit of an herbal kick without much alcohol. Pick up a bottle of Tio Pepe at your local wine store; it'll only set you back around $16 and has enough for 15-plus of these cocktails. Instructions: In a shaker with ice, combine half an ounce of London dry gin (like Beefeater or, even better here, Beefeater 24), an ounce and a half of fino sherry (like Tio Pepe), 1/2 an ounce of fresh lemon juice and a 1/4 ounce of simple syrup. Shake that all up together hard, then strain into a tall glass over fresh ice. Top with 2 ounces of club soda and garnish with lemon wheels.